Prince Otto Eduard Leopold von Bismarck-Schönhausen Duke of Lauenburg (1 April 1815 – 30 July 1898) was an aristocrat and statesman of the 19th century in Europe. As Prime Minister of Prussia from 1862 to 1890, he was mainly responsible for unifying the many independent German countries and founding the German Empire in 1871. He became the first chancellor of the new Empire. He was Graf von Bismarck-Schönhausen (Count Bismarck-Schönhausen) in 1865, then since 1871 Fürst von Bismarck (Prince Bismarck) and since 1890 the Herzog von Lauenburg (Duke of Lauenburg). At first he did not want the duke title, but accepted it later. Bismarck was very conservative and he was strongly connected to the monarchy. He was not a big supporter of democracy. 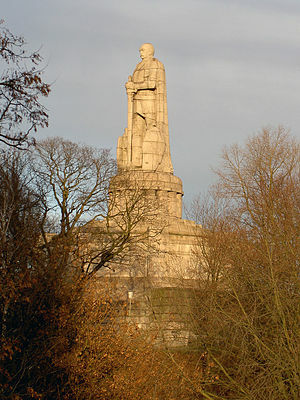 His most important goal was to make Prussia stronger and he achieved that through the unification of Germany. Bismarck tried to stop the socialist movement and to reduce the power of the Catholic Church. One way to stop socialism was to make the working class happy. He did that by introducing many social reforms like public health and accident insurance, as well as pensions for old people. This page was last changed on 19 April 2014, at 07:20.